It's been a while, so I feel the need to update the blog, but while I have been working on things, the truth is I have been working on too many things at once, and not getting any of them finished. Two weeks ago, the number of WIPs stood at 8, and I have added two more this week. And pulled fabric for a third. And I am seeing lots of Christmas pillows appear on Instagram and started thinking that I should stage a seasonal windowseat makeover. I have been hoarding Christmas fabrics for years and it would be nice to use them for something! All Echino all the time! I also want to make Debbie Grifka's snowflake tree skirt, but have been for weeks undecided on a color. Or I have decided on hot pink but think maybe I should choose again, because I don't live by myself. He's a very tall soldier! I wonder if he was in a set? Oh! Christmas! We are getting our tree tonight! 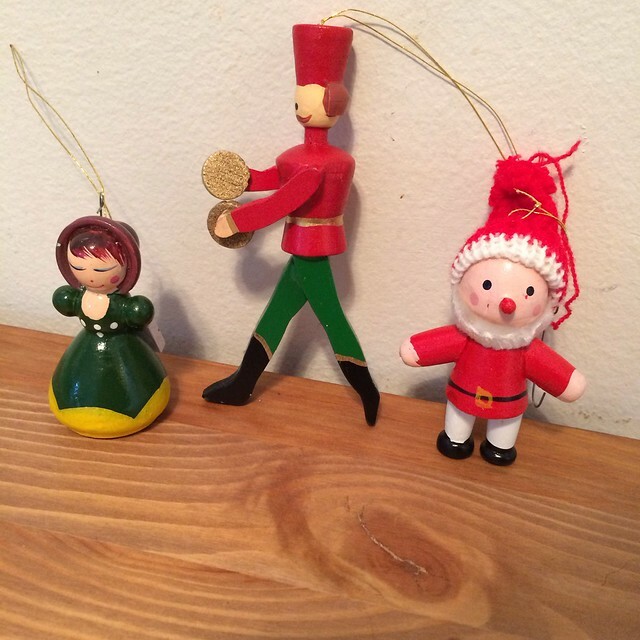 I picked up some adorable wooden ornaments from the thrift store this morning. It is my favorite place to scavenge for old fashioned sorts of ornaments. 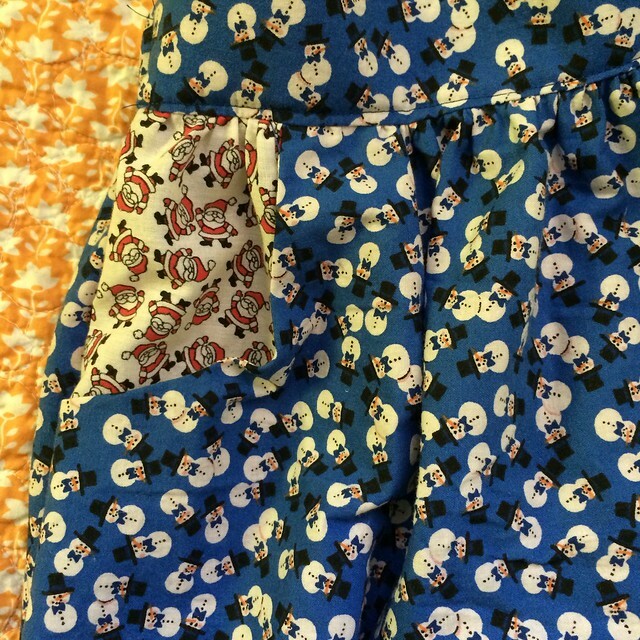 My only handmade gifts (so far) are these snowmen skirts of my daughters. This is one, but I made two - however they are identical. 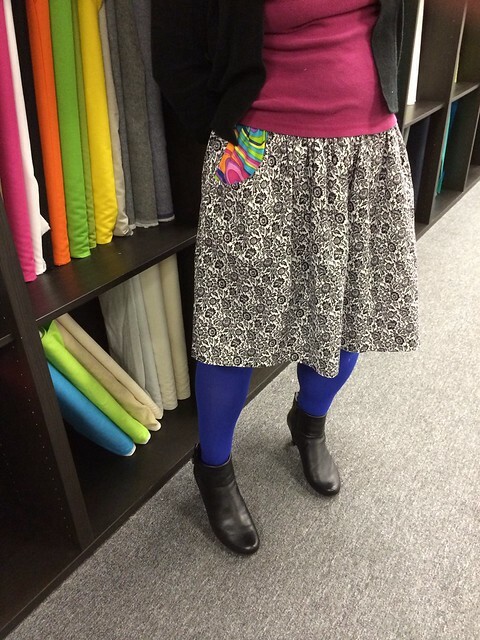 I took a class from Rae of Made by Rae at Pink Castle Fabrics on how to make this "made to measure" skirt, and these are just smaller versions of that. I used my serger on lots of seams, because I am lazy. My friend Stephanie took the picture. We're by the linen at Pink Castle! This is the one I made in the class. The thing I love about this pattern are those great big cut out pockets! I didn't actually reduce the pocket size proportionally, so the pockets are huge! I used Santa ditzy fabric for the girls' pockets. It's the medals from Red Letter Day! It is amazing what you may find in some quilt shop somewhere! Always worth a look... The contrasting pockets will be the ducks, which I got a yard from Etsy a while back, and that will be the last of them... The end of an era! 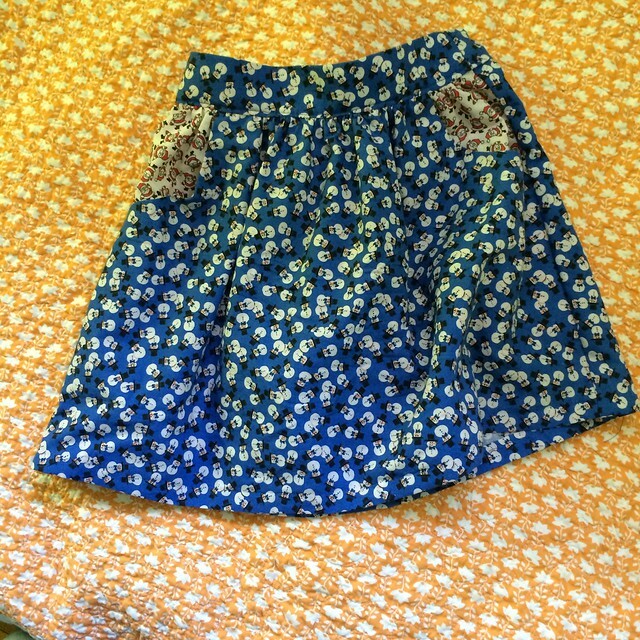 But as long as the era ends with a new adorable skirt, who is complaining? not the best picture! It was windy, and my garage is not the prettiest. 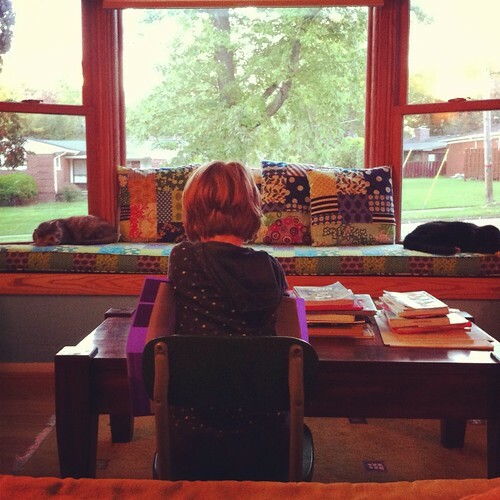 One other thing (among the many) I have been working on is a neutral tumbler quilt. I cut most of these pieces out with my big shot and newest (then) die - the 4" tumbler - around Halloween, when we were watching horror movies, so there is a bit of disquiet embedded in this project - at least for me. 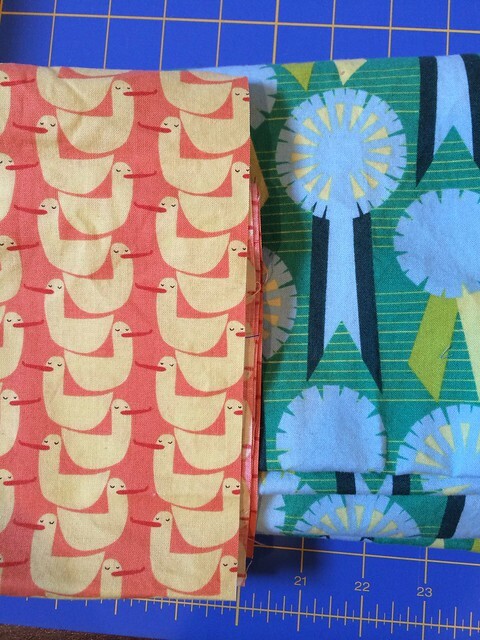 This has been on my mind for awhile; I started buying these fabrics at Easter. 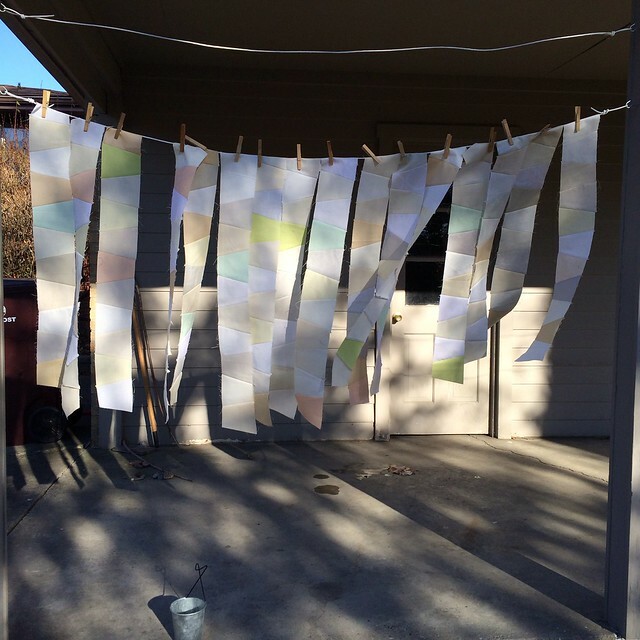 I read Yoshiko Jinzenji's amazing book "Quilting Line and Color" and that was the first time I really thought about the different shades of white. But because it's me, I wandered from whites and ivories and added a few grey tones and pastels, then some subtle blenders. I auditioned a whole slew of white on white fabrics, but the only one I liked were pale crosshatches from sketch and Architextures and this one beige pearl bracelet. So I went with that. But now a few more crosshatches are available from Carolyn Friedlander's new line Botanics, which I have ordered, (though I expect the light blue will be the only one I use in this project) but as they have not yet arrived, this quilt on hold for now. Those rows are 11 or 12 tumblers long, I'm going for 24, because I think that will give me with 18 rows (16 pictured), a 6 foot square couch quilt? 3 days before Christmas, and still much to do.